Network Distributing have announced the October DVD release of two more films from "The British Film" Collection, the 1931 The Gaunt Stranger and the 1959 The Headless Ghost. An atmospheric adaptation of The Ringer – the play that earned global fame for English master of suspense Edgar Wallace and that remains his best-known story – this classic whodunit combines taut direction and inspired characterisation. Patrick Barr stars as a beleaguered Scotland Yard investigator, John Longdon his hawkish superior and, in an early film role as a particularly haughty secretary, Patricia Roc. Also notable as the first film produced at Ealing by Michael Balcon, The Gaunt Stranger is presented here in a brand-new transfer from the original film elements in its as-exhibited theatrical aspect ratio. 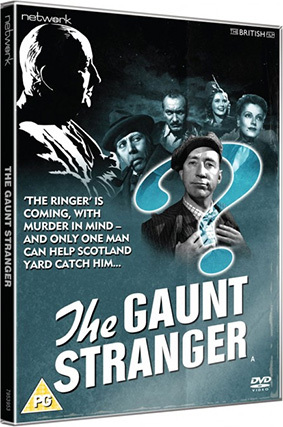 The Gaunt Stranger will be released on UK DVD on 21st October 2013 by Network Distributing at the RRP of £9.99. One of the first films made in Britain by B-movie maestro Herman Cohen, The Headless Ghost is an entertaining example of the teen-horror genre emerging with Cohen’s 1957 classic I Was a Teenage Werewolf. Involving the adventures of three young thrillseekers investigating a haunted castle, the film boasts an early role for New Zealand-born Clive Revill and a sensational dance sequence featuring Josephine Blake; it is presented here in a brand-new transfer from the original film elements in its as-exhibited theatrical aspect ratio. 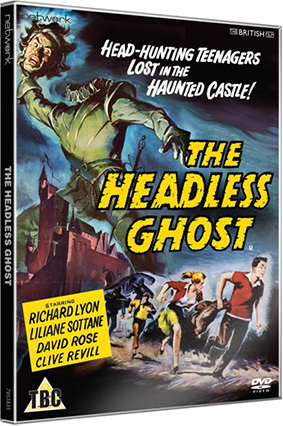 The Headless Ghost will be released on UK DVD on 28th October 2013 by Network Distributing at the RRP of £9.99.